The modern mammal metropolis of Zootopia is a city like no other. Comprised of habitat neighborhoods like ritzy Sahara Square and frigid Tundratown, it’s a melting pot where animals from every environment live together—a place where no matter what you are, from the biggest elephant to the smallest shrew, you can be anything. But when optimistic Officer Judy Hopps arrives, she discovers that being the first bunny on a police force of big, tough animals isn’t so easy. Determined to prove herself, she jumps at the opportunity to crack a case, even if it means partnering with a fast-talking, scam-artist fox, Nick Wilde, to solve the mystery. Walt Disney Animation Studios’ “Zootopia,” a comedy-adventure is directed by Byron Howard (“Tangled,” “Bolt”) and Rich Moore (“Wreck-It Ralph,” “The Simpsons”) and co-directed by Jared Bush (“Penn Zero: Part-Time Hero”). Download Zootopia in Digital HD from the iTunes store. Zootopia images are © Walt Disney Pictures. All Rights Reserved. 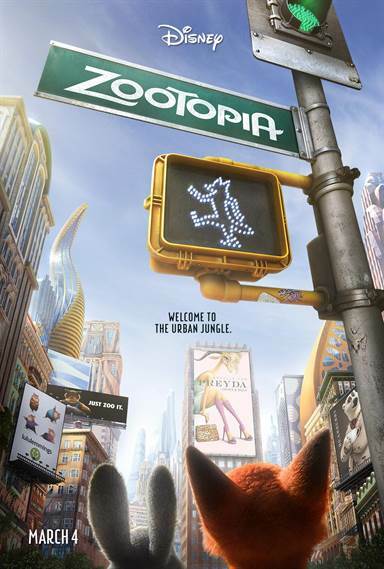 Known for their cute, fun animated feature films, Disney takes a drastic turn with their new release, Zootopia. Usually shying away from controversial topics, this time they delve in head on to one of the most stressful topics plaguing our country right now - racial tension. Along with other moral messages, the film artfully navigates the muddy waters of police violence. Judy Hopps (Ginnifer Goodwin; Once Upon A Time) has always looked out for the "little guy" and has dreamt of being a police officer from the time she was young. Not the typical recruit she faced ridicule and discrimination that forced her to work harder and graduate from the police academy at the top of her class. Another message of the film, she believes "anybody can be anything they want to be". Now in her "dream job" Judy is relegated to meter maid duty until she strikes a deal with her chief to help solve a missing person's case. She ends up enlisting the help of a shady, sly fox named Nick Wilde (Jason Bateman; Arrested Development) who is actually more than he seems and is damaged by stereotypical discrimination he suffered in his childhood. With the bad guys not being who you think, there is a plot twist most adults will probably see coming. As with most Disney film the cast is terrific and Goodwin and Bateman play off each other like a well oiled machine. There is plenty of schmaltzy dialogue one would expect from Disney and typically, many of the jokes would go over younger audiences head but will serve to entertain the adults. The 3-D animation is excellent and worth the extra few dollars of the price of admission. The animation is fantastic with vibrant colors and attention to detail and certainly doesn't disappoint. The story flows beautifully and the many moral messages embedded in the movie make you want to groan and smile simultaneously. Hopps' optimism is infectious, as you would expect and it's nice to see Disney continue their latest trend of portraying strong females as positive role models for little girls. Of course there are adorable characters that will no doubt become the newest "must have" toys. One of the better recent Disney creations, this film will definitely do extremely well in theaters as it should. Great movie. Lessons to live by.